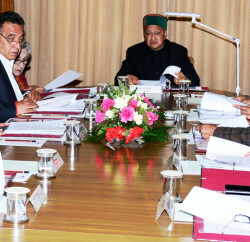 Himachal Pradesh Cabinet in its Meeting decided to amend the Industrial Policy of the State with a view to incorporate provisions of promoting environmentally sustainable industrial development in the State and promote cleaner production and adoption of environmental management system; disincentive industries on negative list and promote public disclosure of pollution status at the unit and cluster. Chief Minister presided over the Meeting. It has been decided to increase the term of the Benami Land Deals Inquiry Commission further by three months upto March 31, 2012 to provide additional time to the people to bring cases relating to ‘Banami’ land transactions to the notice of the Commission to enquire into. Cabinet has approved to amend the Rule 69-B of the Himachal Pradesh Motor Vehicles Rules, 1999 to slash/reduce the ‘Special Registration Fee’ of choice numbers in respect of registration mark from 0101 to 9999 from Rs. 20,000 to Rs. 5,000. It has been decided to amend the First Schedule of the Himachal Pradesh Minor Minerals (Concession) Revised Rules, 1971 to revise existing rates of royalty of minor minerals. It has also been decided to grant concessions for extraction/exploitation of minor minerals including mining of minor minerals in hill slopes to the interested private parties in district Sirmour. It granted permission to issue No Objection Certificate in favour of Albiet Educational and Welfare Trust, in non preferred location of village Lower Basal, tehsil and district Una, to admit 40 trainees in B.Sc. 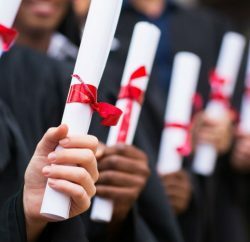 (Nursing) degree course. It has been decided to de-reserve the post of Deputy Mayor in Municipal Corporation, Shimla, as per the provisions under section 36 of the Himachal Pradesh Municipal Corporation Act, 1994. It approved pre-poning of the date of completion of the High Security Registration Plates Scheme in existing vehicles from November 14, 2013 to June 15, 2012. It has been decided to continue with the existing principles/guidelines for convening DPCs for selection posts in different departments of the State. Cabinet has approved to fill up 50 posts of Firemen and 4 posts of Company Commander in the Department of Fire Services and Civil Defence; 39 posts of different teaching and non-teaching categories in Atal behari Vajpayee Government Institute of Engineering and Technology at Pragati Nagar, district Shimla; two posts of Geologists in Industries Department on contract basis; two posts of Professors in Ayurveda and one post of Reader in Rajiv Gandhi Government Ayurved College, Paprola from amongst the retired teachers; and one post of Kanungo and one post of Patwari in the Benami Land Deals Commission to be filled up from amongst the retired incumbents. It approved Recruitment and Promotion Rules for the post of Executive Engineer (Horticulture) Class-I Gazetted in the Department of Public Works; amendment in the Recruitment and Promotion Rules of Animal Husbandry and Veterinary Services, Class-I Gazetted. 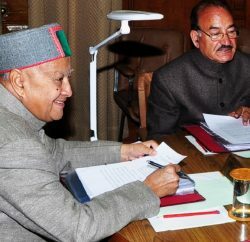 It granted approval to Himachal Pradesh Advocates Welfare Fund (Amendment), 2011 and Amendment in the Himachal Pradesh Public Premises and Land (Eviction and Rent Recovery) Amendment Bill, 2011.